There’s nothing quite like curling up in bed after a long day, so I like to make my bed into a comfortable nest where I’m nice and cosy. This includes nice sheets, plenty of soft pillows and a beautiful duvet set. 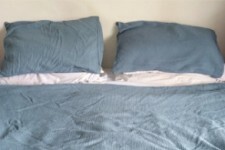 I recently bought this silver blue set, and I love how it’s transformed my bed into somewhere so relaxing. I thought I’d treat myself to some nice new pyjamas while I was at it, and these are a few of my favourites that I found at EziBuy. I like night shirts because they give me freedom to roll around and wriggle as much as I like (I’m quite a restless sleeper). I bought the short sleeve night shirt recently in the grey and white stripes and I’m loving how soft and comfortable it is. There are a number of different colours and prints to choose from in both designs, so you can find a nightie to suit you. Pyjamas are my go to for if I’m planning on lounging around before bed (perfect for watching a movie on telly! ), if I’m staying away from home and want that extra bit of home comfort, or if it’s a little bit cooler. Both designs come in different colours, and the pyjama pants can be mixed with a sleep tank if your body tends to get quite warm during the night. EziBuy is an official charity partner of the Breast Cancer Cure initiative, and they’ve joined the quest to help find a cure for breast cancer. To help with fundraising, they’ve teamed up with New Zealand designers Trelise Cooper, Andrea Moore and Moochi to make some gorgeous nighties, with part of the proceeds going toward finding a cure. My favourite is the Moochi one, which is yours? Which do you prefer to sleep in – nighties or pyjamas?